This western state is a paradise for outdoor enthusiasts—and those who like to drink beer. Getting up uncharacteristically early to witness the sunrise over the Garden of the Gods, a striking natural formation in southeastern Colorado. The constantly changing colours of the strange chunks of mountain jutting out of the ground, with Pikes Peak in the background, made the early hour more than worthwhile. But what was amazing was that well before 6 am, dozens of locals from nearby Colorado Springs were parking off the highway, soon to be engaged in predawn running, rollerblading and cycling. No doubt they then drove into the park to do some sheer cliff scaling, as I’ve since noticed that the Garden of the Gods (usually unnamed) is featured in many outdoor fitness advertisements for the super fit, many of whom we saw scaling sheer cliffs when we strolled through the park later in the day. I guess I should have figured on witnessing this devotion. As I flew into Denver, I happened upon an article explaining that Colorado is the fittest state in the United States. Another stated it had some of the finest stout beer in North America. Interesting combo. As I continued to read, I discovered that one of the reasons explaining Colorado’s fitness was its high altitude. That is to say that being so far from the centre of the earth actually strengthens one’s heartbeat, improving fitness. Acclimatizing to the high altitude isn’t the only benefit of this state. In fact, walking in the downtown core of Denver, I was pleased to come upon many a microbrewery, all offering their own version of local stout, a definite favourite in this part of the world. As with all real stout, it’s by far best consumed on the premises. Wandering between microbreweries and cowboy shops (don’t miss Rockmount Ranch Wear), I immediately connected to Denver, which is in many ways similar to Calgary, back home in Alberta. As I cycled along the Cherry Creek that traverses downtown Denver, I noticed there were a lot of serious cyclists on the path with me. This is not the kind of path to sight see on. Denver is a great walking city and you can bike or walk to the Clyfford Still Art Museum, which was built to house the works of American painter Clyfford Still. Here I made another new connection. The man who started the first microbrewery in downtown Denver later convinced the widow of Clyfford Still to donate his entire collection to the city of Denver. Quite an enterprising lad, I surmised. Guess what he’s doing today? He’s Colorado’s governor. Although Clyfford Still is recognized as one of the pioneers of American abstract expressionism, I was pleased to see that much of his earlier work was accessible, and to my great surprise included scenes he painted by memory from his days growing up in southern Alberta. 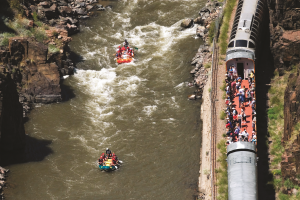 White water rafting at Buena Vista. At Manitou Springs in southeast Colorado, we tested the many kinds of natural fizzing waters before heading off to the base of Pikes Peak. There are basically three ways of getting to the top: Drive your car, take the Cog Railway, or walk up the brutally steep Manitou Incline. More stout was consumed from a local microbrewery, as I contemplated what to do next. 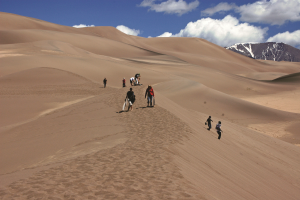 Still in southeastern Colorado, we headed to the Great Sand Dunes National Park. Part of the fun was crossing a narrow river and then climbing the massive dunes that we would soon be whizzing down. I must admit that near the top of one of the dunes I start feeling the altitude—that same Denver altitude plus or minus 1,000 feet! In the same area of Colorado, we paddled down the Arkansas River at Buena Vista. Although white water rafting was new to me, for some reason I was put at the front of the raft. This meant that, theoretically, other rowers would be looking at me to check they were doing the right thing. Bad choice. Above the roar of the water and the screams of the other passengers, I had trouble hearing the orders from our captain. After hiking at the Dunton Hot Springs we relaxed at this former ghost town refitted as a hot springs resort. The Sundance Kid went here after robbing his first bank. (Guess he needed to relax). 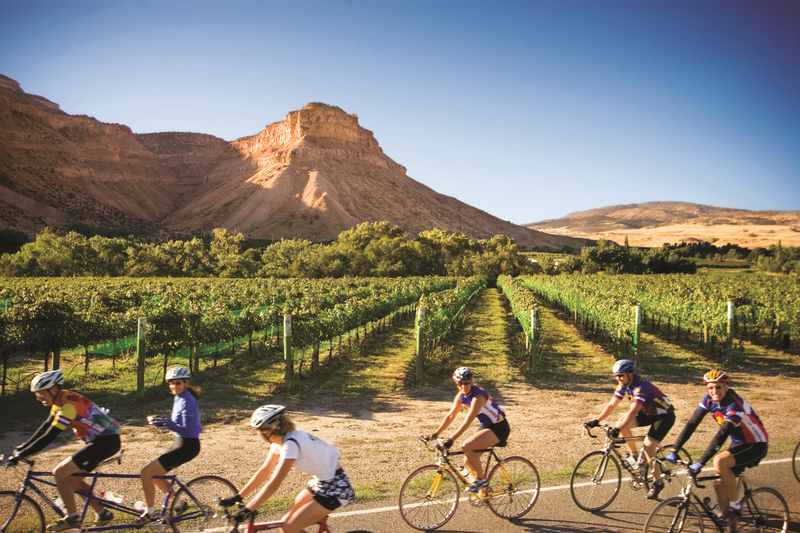 Today, cyclists love this spot as well as the main town in these parts, Durango, known for its mountain biking, western movie locations and, (don’t be surprised), it’s great local stout.